She slid our dogs through a side pick-up window and we retreated, tray and a bag of peanuts in hand, to the diner booth outside. Lifting our dogs in the air as coleslaw and chili dribbled onto the waxed paper below, we toasted the kickoff of our trip. The passionate declarations of loyalty I’d overheard between interviews suggested that there was more to hot dogs in West Virginia than just that four-ingredient list. Chili, slaw, mustard, and onions: Since moving to West Virginia last fall to work as the state folklorist, I’ve answered with that refrain when asked how I want my hot dog dressed. My travels to conduct interviews with vernacular artists and document community-based traditions often include stops at hot dog joints. These lunch counters, ice cream stands, and country stores are sometimes the only lunch option in rural areas. The passionate declarations of loyalty I’d overheard between interviews suggested that there was more to hot dogs in West Virginia than just that four-ingredient list. To better understand this cultural phenomenon, I enlisted the help of a fellow folklorist who also happens to share my first and middle names. That’s how Emily Wallace and I found ourselves on a 286-mile loop that we affectionately dubbed The Emily Elizabeth West Virginia Hot Dog Road Trip. Arriving at my Charleston apartment wearing a hot dog T-shirt and a pickle pin, Wallace prepped for our journey by illustrating a Google map with hot dog doodles (they still pop up on my phone whenever I near one of our dog stops). I consulted The West Virginia Hot Dog Blog, founded in 2006 by a native who goes by the nom de sausage of Stanton. Yes, he has rated hundreds of joints with a 1-5 weenie system. 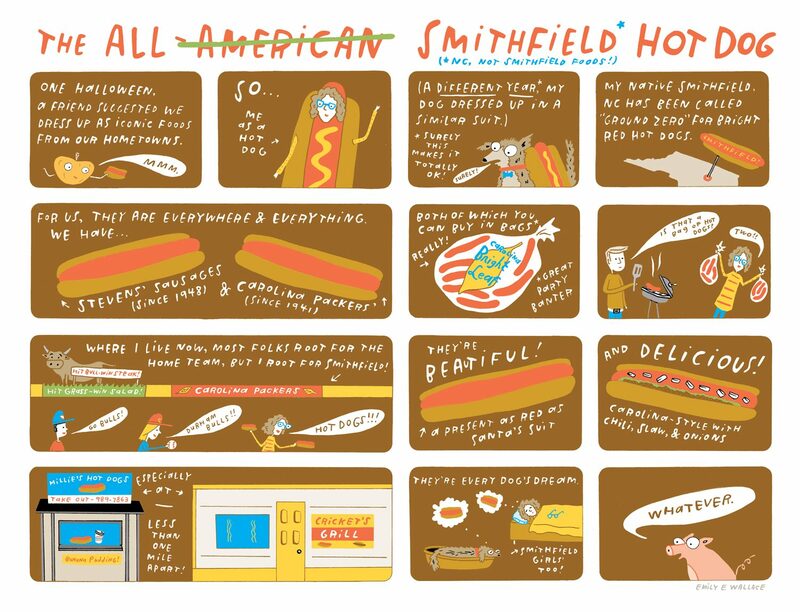 But he has also elucidated a taxonomy of hot dog styles and, most important, developed a Slaw Mapping Project that would make any digital humanities scholar proud. 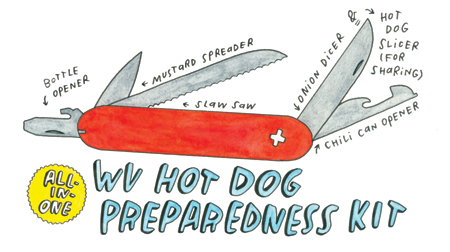 The perfect West Virginia hot dog is an exercise in balance. Compared to eastern North Carolina’s bright-red dog or the Chicago-style Vienna Beef (which Wallace and I grew up on, respectively), a West Virginia hot dog relies less on the sausage and more on the interplay of spicy, hot chili and cool, sweet coleslaw. 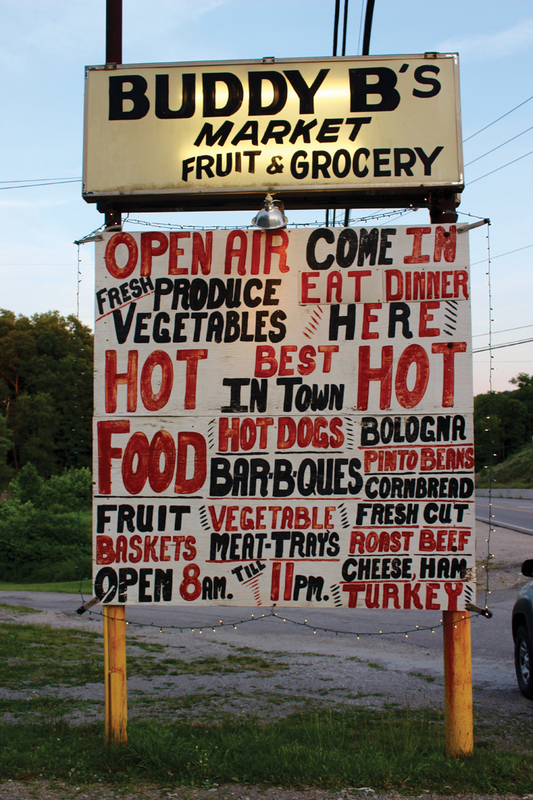 Over the course of our trip, we learned how to parse variations on that iconic combination, but as folklorists, we also recognized that the stories locals tell about these places were the true dressing on West Virginia dogs. 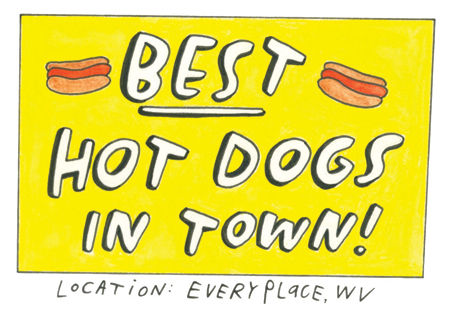 West Virginia is home to at least 350 hot dog joints (and that’s playing it safe). Almost all claim “Best Hot Dogs in Town.” In a state of fewer than two million people scattered across 24,000-odd mountainous square miles, that’s a surfeit of hot dogs. Presented with this bounty, I narrowed our quest to a loop that ran through the southern coalfields. We planned stops at drive-ins, convenience stores, and an ice-cream stand. That route put us firmly beneath the Slaw Line, which West Virginians recognize as a kind of Mason-Dixon of condiments. 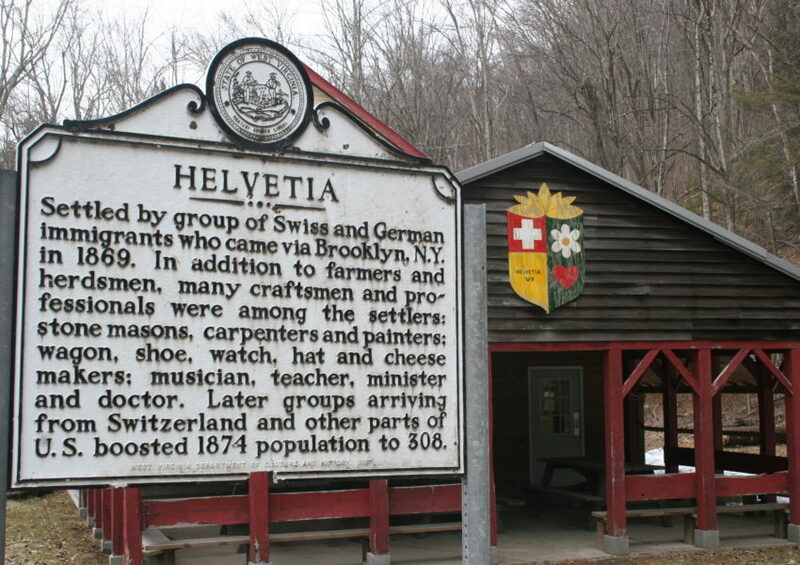 We’d miss out on some of the regional variants, particularly in the northern part of the state, where Italian heritage is strong and slaw is often unavailable. There, in what is also pepperoni roll country, chili is referred to as “sauce,” and doubles as a pepperoni roll topping. 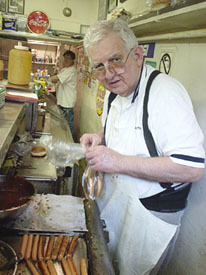 Meet Birmingham legend, Gus Koutroulakis, of Pete’s Famous Hot Dogs in this SFA oral history. Koutroulakis passed away in 2011. We weren’t through with Sissonville after a couple of Buddy B’s dogs. The next morning, we scouted Skeenies, peering in the windows of the unlit kitchen. In business since 1953, the yellow-and-white roadside stand inspires both local loyalty and expat longing. Mrs. Skeen (as she’s reverently known), now in her nineties, runs the place with her son Joshua. As Wallace wondered out loud if they had any signature waxed hot dog bags she could take home as souvenirs, Joshua Skeen, who lives next door with his mother, walked over to greet us. Soon we were deep in a conversation about West Virginia hot dog history. We know a bit more about the beginnings of slaw dogs. 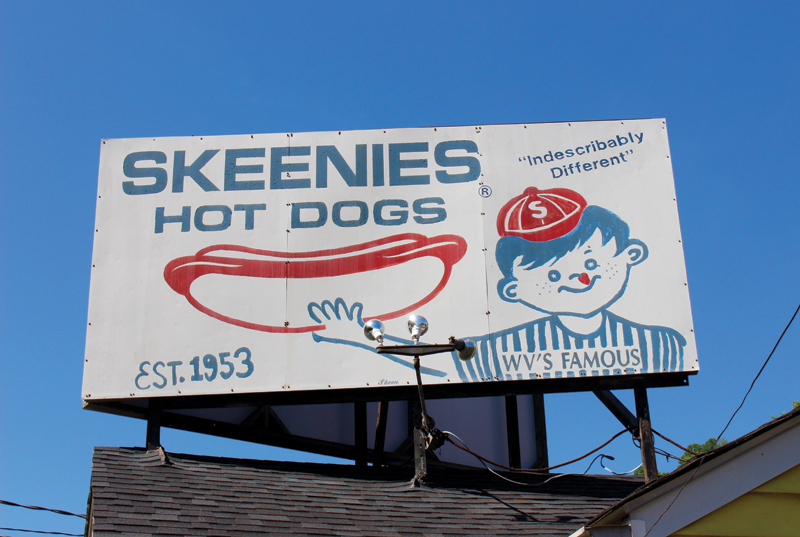 Just a bun’s throw from Skeenies is the site of the former Stopette Drive-In, arguably the originator of the slaw dog. 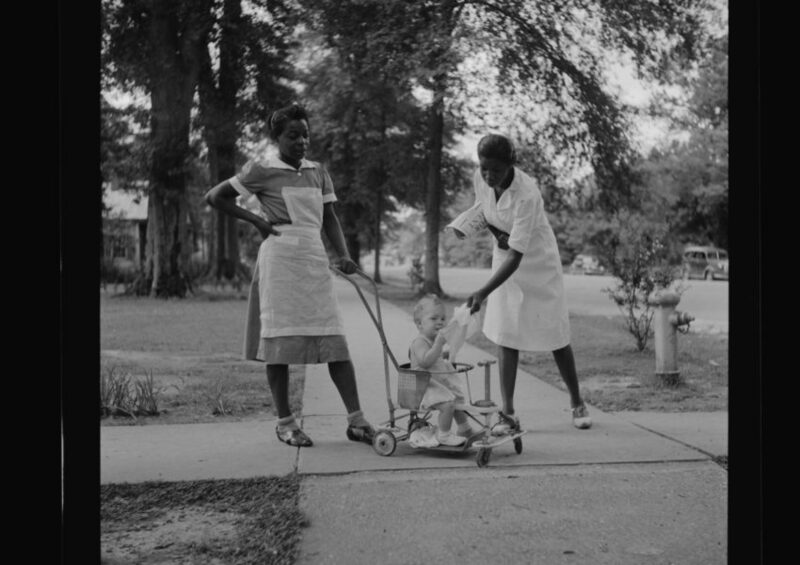 Documentation of those early years is scarce. But we do know, thanks to Stanton’s research, that the Stopette advertised slaw dogs in the local newspaper by the 1920s. “Everybody’s talking about Stopette’s hot dog with slaw,” read a 1922 ad. Cabbage was a common home garden crop, and slaw made a hot dog more filling. In 1951, a Charlotte Observer writer joked that slaw was the only good thing that West Virginia hillbillies brought south to the Carolinas. A more detailed history of West Virginia dogs has yet to be written. But I’m pretty sure of one thing: The popularity of hot dogs here is linked to the industrial labor that boomed in the late nineteenth and early twentieth centuries. Coal miners, steel workers, and other factory laborers needed a quick meal they could eat between or during shifts. Hot dogs, like pepperoni rolls, proved an inexpensive and filling option. Entrepreneurs sold them because the ingredients were cheap and demand was high. The popularity of hot dogs here is linked to the industrial labor that boomed in the late nineteenth and early twentieth centuries. After Skeenies, Wallace and I made our way about an hour south to the 1,800-person town of Logan, which boasts two hot dog–slinging drive-ins. Parkway, with its red-capped carhop sign, is near the home of folk legend and banjo player “Aunt Jennie” Wilson and adjacent to Chief Logan State Park. Morrison’s Drive-In sits alongside the Guyandotte River, south of town. chicken in the fingers here in the box to go reads the inscrutable message on their faded red-and-white sign. We ordered one dog at each. Our waitresses gave us strange looks. Did they think we were abstemious, or just plain silly? It didn’t help when I pulled out my trusty red Swiss Army Knife to halve our dogs. But I couldn’t help myself. Like a girl scout, a folklorist is always prepared. Around back at Morrison’s, leather-clad bikers convened at the picnic tables while families in minivans and couples in trucks circled the perimeter. A server brought our prize on a metal tray and hooked it over our car window. Surprisingly, it came slawless. As I sang a variation of Beyonce’s “Flawless” (“I woke up like this—slawless”), Wallace, determined not to be deprived of cabbage, jumped from the car to ask the waitress for a side order. At this point, we became the weenies of the story. After eating just three dogs between the two of us, we were queasy. Wallace blamed the curvy mountain roads. I named the June heat. But the promise of J’s Grocery in Kegley, which one of Stanton’s fellow hot dog bloggers called “the fulfillment of some hot dog shaman’s ancient prophecy,” beckoned. We made a call to the convenience store, nearly a hundred miles away. It was our second dial that day. “Is Marie still making dogs?” I asked, seeking encouragement. Her husband, who answered again, confirmed that indeed she was. “Who is this?” he asked. We pressed onward. Driving south through the mountains, past rolling rivers, mine sites, and abandoned company stores, we stopped in the small town of Oceana to stretch our legs and buy snap beans from a roadside stand. A group gathering donations for a local political candidate asked if we wanted free hot dogs. We gave them a polite no thank you. The paper-wrapped hot dog arrived hot, in a grilled bun brushed with butter. Topped with homemade chili, thick-cut onions, and gobs of mustard, it achieved the synergy that defines the best West Virginia dogs. 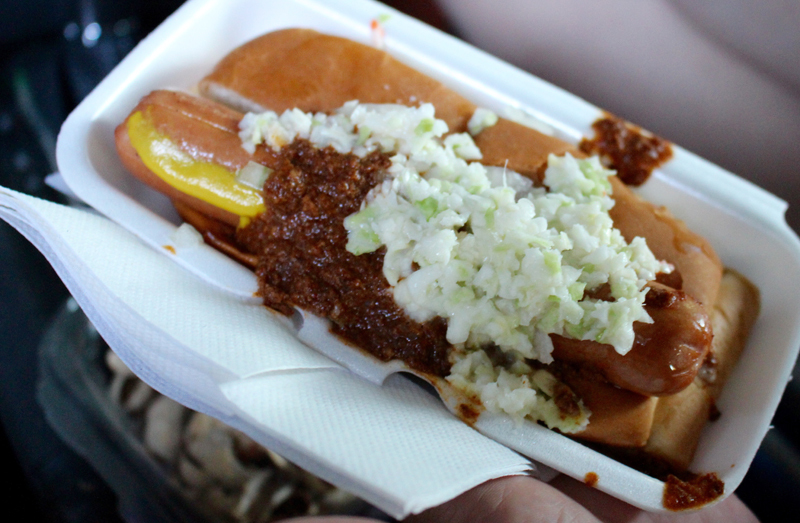 Unassuming yet distinctive, the dog was worth driving for—a chili-slathered, slaw-capped representation of Marie herself. Though we would make three more hot dog stops and one swimming stop at Sandstone Falls that afternoon, we knew it was time to turn north toward home. 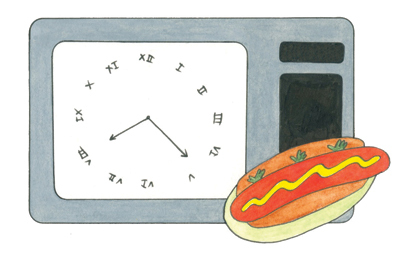 Slap-happy, we improvised hot dog jingles as we drove, following “Little Red Hot Dog” (which, no joke, came to me in a dream) with the rallying song “One More Hot Dog.” We were done—ready for a salad, some snap beans, and a beer to wash it all down. 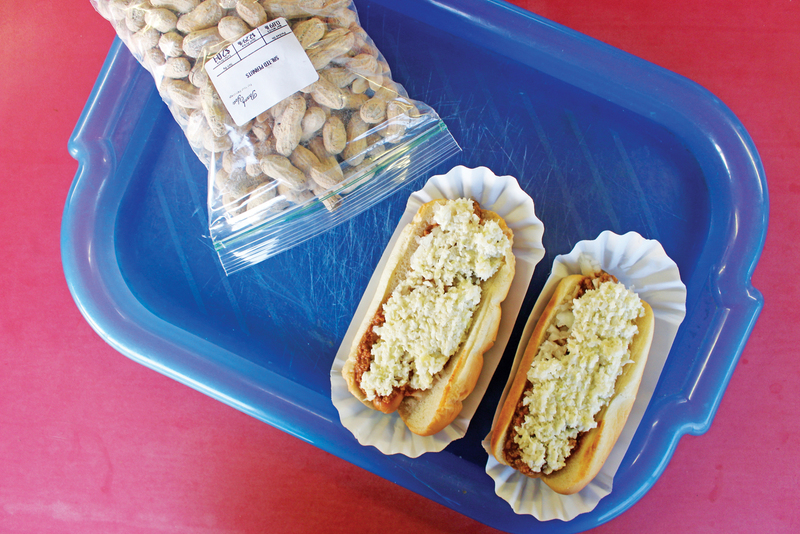 It’s easy to take hot dogs for granted in West Virginia. Like pimento cheese sandwiches in North Carolina, slugburgers in Mississippi, and the pepperoni rolls of my adopted state, they are fast and filling. Priced at a buck or three, they’re cheap and convenient, pervasive and dependable. Industrially produced wieners and buns make preparation quick and easy. 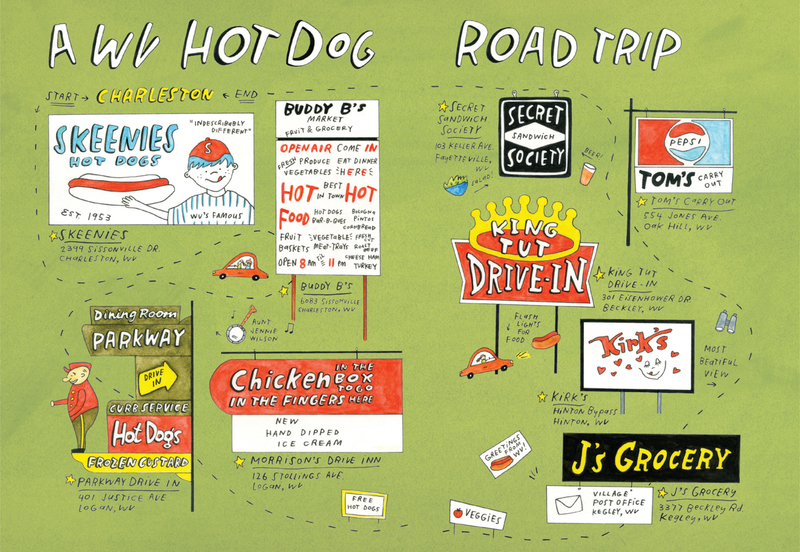 From a first job to a first date, hot dog joints are often the sites of important life milestones. Prefer to see your dogs in print? 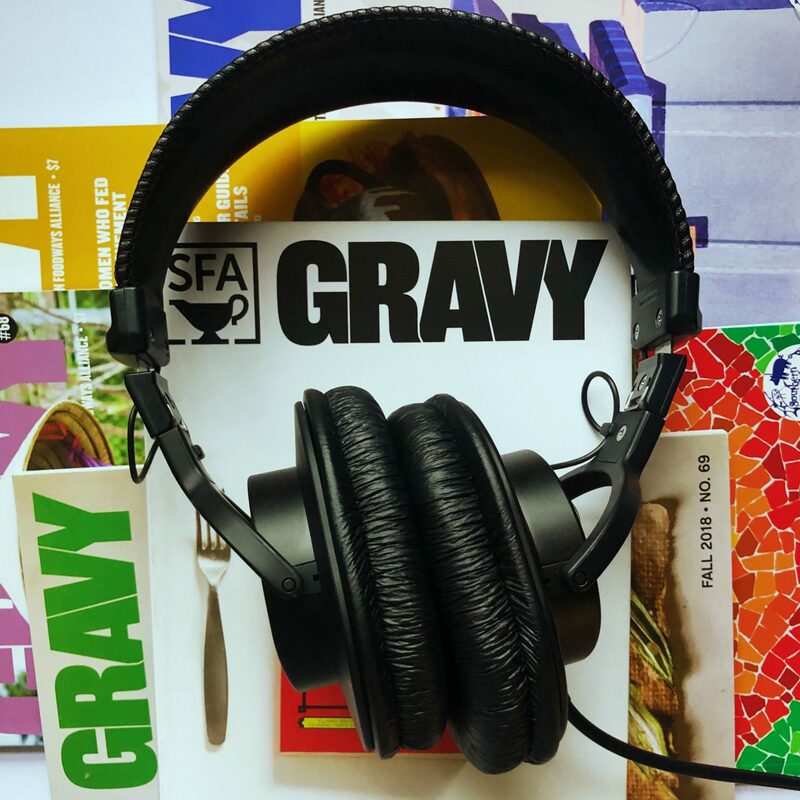 Become a SFA member. Because hot dog establishments are a central (and sometimes the only) gathering place in town, they serve as multi-purpose community centers. From a first job to a first date, hot dog joints are often the sites of important life milestones. 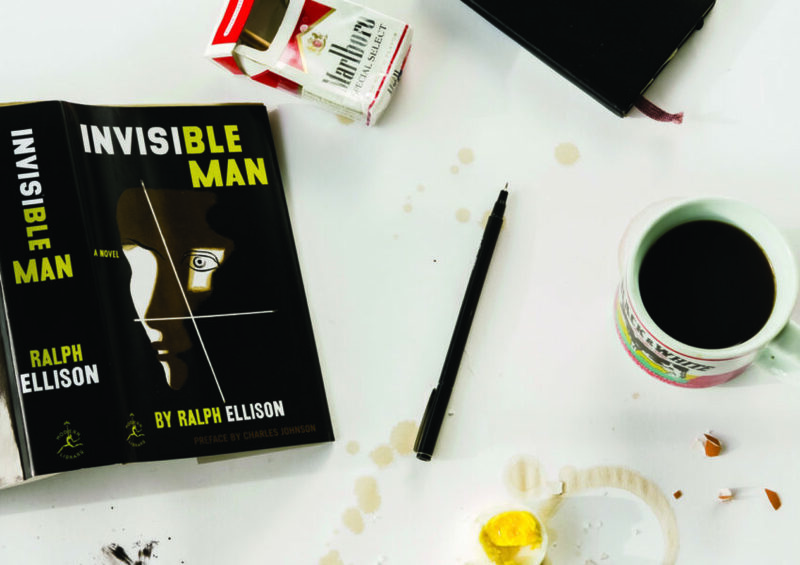 As West Virginia writer V.C. McCabe put it, her hometown hot dog stand was a “building of memories.” The double meaning of “building” as both a noun that describes a physical structure, and a gerund that represents the layering of meaning was, I’d like to think, intentional. While hot dogs and the businesses that sell them inspire devotion, they evoke a sense of precarity, too. The men and women who run the hot dog stands of West Virginia have not escaped the economic, social, and environmental drag in a state with a declining population and rising unemployment. Profit margins aren’t what they used to be, Joshua Skeen told us. His mother used to make more money when Skeenies charged ten cents per dog in 1953. Today, at $1.90 for a fully loaded dog, the profit margins are lower. Devastating floods swept through the state just days after our road trip. Clendenin’s Dairy Queen, initially on our route, was destroyed. In Sissonville, high waters swept across roads, farmers’ fields, and family camps, rendering them unsalvageable. As the state rebuilds from recent environmental calamities, though, hot dogs are playing a role. Chum’s in Marmet, famous for its yellow mustard slaw, recently set up in Clendenin to give away free dogs to the flood victims and volunteers helping with recovery efforts. Stewart’s Hot Dogs in Huntington and Kenova became drop-off sites for flood victim supplies. While a hot dog can’t restore what West Virginia has lost, it can offer comforting sustenance, affirming the strong ties that bind local hot dog joints and the community of people who sing a common refrain of chili, slaw, mustard, and onions. Emily (Elizabeth) Hilliard (left) is the West Virginia state folklorist and the author of Nothing in the House, a blog about pies. Emily (Elizabeth) Wallace (right) is an illustrator and writer based in Durham, NC. She is also Deputy Editor of Southern Cultures quarterly at UNC-Chapel Hill. Visit The West Virginia Hot Dog Blog at wvhotdogblog.blogspot.com. This cartoon by Emily Wallace first appeared in Gravy #54, the “Pop Goes the South” art and photography issue.